There are currently bus transfers operating between Portarlington and Portlaoise stations. Emergency services dealing with the fire this evening. IRISH RAIL TRAINS are currently not stopping at Portarlington Station due to a fire in a nearby building. There are currently delays of up to 50 minutes on services leaving Heuston Station in Dublin. Emergency services are currently attending the fire and Portarlington Station has been temporarily closed. There are bus transfers operating between Portarlington and Portlaoise stations. Irish Rail said it currently did not have information on when trains would resume stopping at the station. 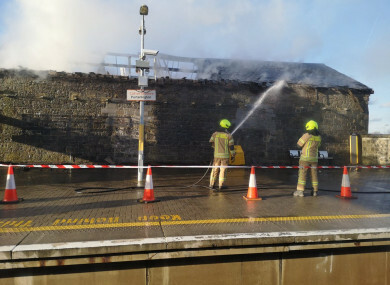 “Services will not stop at Portarlington due to a fire in a building adjacent to the station,” the rail service said on Twitter. Portarlington is a busy rail station and town on the border of Laois and Offaly. Trains pass through travelling to and from Dublin and the west and southwest of the country. Email “Trains not stopping at Portarlington Station due to fire in nearby building”. Feedback on “Trains not stopping at Portarlington Station due to fire in nearby building”.